When I read the Institute for Creation Research’s call for Young Creation Scientists, I first thought: This sounds a lot like Francis Egerton, 8th Earl of Bridgewater’s justification for the Bridgewater Treatises. ICR’s call, however, lacks both the polish of Egerton’s style and the charm of his eccentricity. My second thought was: Perhaps Virginia Heffernan can get a job as a science writer for ICR. Heffernan recently explained why she is a creationist. Critics of Heffernan’s post abound, e.g., Virginia Heffernan’s creationism: Why evolution matters and Yes Virginia, There Is a Darwin and Finding the narrative, as do her defenders. I suspect that Francis Egerton, if he had a blog, would be a critic. Thanks to Daring Fireball for the link to ICR’s post. Over the last few days the Smithsonian Magazine has been drawing attention to their recent blog post about astrology and relationships (see this search): “Good News: Astrology Doesn’t Impact the Success of Your Marriage.” Unfortunately, the post missed an opportunity to ask interesting questions about why the study attacked astrology and why it represented as it did, and about why astrology remains such a mesmerizing target for scientists and science cheerleaders. 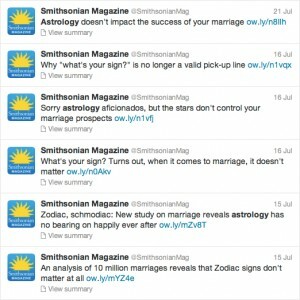 The Smithsonian Magazine ’s tweets about astrology and relationships. 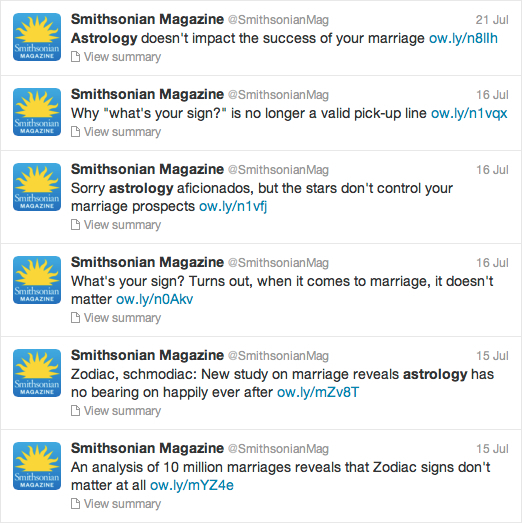 The post summarizes a study from 2007, which found little correlation between sun signs and choice of spouse, and an earlier study, which concluded that further research was needed to “to find out whether astrology columns really are just a bit of harmless fun or whether people’s behaviour is influenced without them realizing it.” Beyond link bait, it is unclear what the Smithsonian post was intended to accomplish. It invokes that old chestnut that reduces astrology to sun signs. As the comments indicate, it does not engender debate or discussion but rather encourages people to retrench into tired old positions. On the one had, the post reassures opponents of astrology of their righteous opposition and confirms for them that astrology lacks evidentiary support. On the other hand, the post goads proponents of astrology to point out the fallacious arguments that undergird the attacks. A more interesting starting point would have been to ask: Why did the author of the study reduce astrology to sun signs? Further, why did he assume sun signs compel people to marry certain people? That assumption contradicts the traditional aphorism: “The stars incline they do not compel.” Consequently, astrologers since Ptolemy have explained how astrology cannot be a precise, predictive science, certainly not when it comes to predicting human behavior. Who, then, believes that sun signs, one small facet of a much larger astrological edifice, can compel people into action? What does framing an attack on astrology in this way accomplish? Why, given the long history of attacks on astrology, did the author of the study think his criticism would be successful? In Ptolemy’t discussion, astrological configurations portended certain circumstances but did not necessitate them. The configurations Ptolemy highlighted were much more complex than merely sun signs and often included detailed analyses of both the husband’s and the wife’s genitures as well as a comparison of the two. Subsequent astrologers refined, modified, and extended Ptolemy’s doctrine. Nearly every early modern book on astrology includes rules for how to interpret celestial influences on marriages. These guidelines range from a generic comment about seventh house being the house signifying marriage to John Middleton’s detailed discussion of whether or not a person will get married, when, how often, whether it will be a harmonious marriage, etc. As the various interpretations proliferated, so too did the attacks. Critics as different as the religious reformer Jean Calvin and the philosopher Pierre Gassendi wrote a scathing critiques of judicial astrology in which they rejected the astrologer’s ability to predict anything specific about a marriage, including whether a person would be happy in a marriage. The clergyman John Edwards, pointed out that whether or not astrology can make general predictions, astrology cannot predict particular aspects of a person’s life. He singles out marriage as one such aspect. More than four centuries ago both opponents and proponents of astrology had already agreed that astrology could not make precise predictions about marriages. Why, then, bother trying to demonstrate that there is no correlation between sun signs and choice of a spouse? Whose interests are served by spending the time and effort on such a study? Who is the author of the study and the author of the post trying to convince? Why does astrology continue to serve as the paradigmatic pseudo-science? And what do attacks on astrology reveal about the social nature of scientific knowledge? I updated yesterday’s post, “Pamphlets on the Earthquake of 1580,” to include an EPUB version of Arthur Golding’s A Discourse vpon the Earthquake … . While you will be missing out if you don’t go back and read the whole post, if you just want the EPUB file, you can download it here. As with Jan van der Noot’s tract on the plague, EPUB available here, I have created only an EPUB version. Some formatting is lost in the conversion process to a mobi (i.e., a Kindle) version. When I figure out how to solve that problem, I will post mobi versions too. I continue to play with EPUBs as I think about what options they offer for readers and students. One version of van der Noot’s text includes a number of notes that readers can see if they click on the links. Some notes offer definitions of difficult words, other identify contemporary books mentioned in the text, still others explain unusual or unfamiliar terms and concepts. While helpful, such annotations are rather pedestrian and only just begin to enhance the reading experience. Now that the EPUB standard adds considerable support for HTML5 and CSS3, there are many interesting and interactive possibilities. Unfortunately, not all ereaders support all HTML5 options and the Kindle is woefully inadequate in this area. Please send me any suggestions and ideas you might have about what would enhance your reading of early modern primary sources or how I could make them more effective/useful in classes: dhayton(at)haverford.edu.